Mel Gibson's first movie to hit theaters in nearly a year-and-a-half headlines the first post-Olympic weekend of 2002. We Were Soldiers will pit his established position as an all-time box-office star against the rising celebrity of Josh Hartnett in 40 Days and 40 Nights. The competition between the two films should be slight, even with the presence of Chris Klein and Marc Blucas (formerly of Buffy the Vampire Slayer), so the battle should go to the film with the best promotional power. 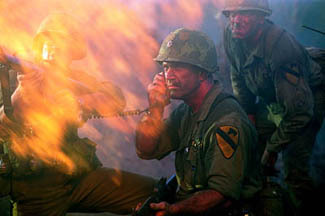 Unfortunately for We Were Soldiers, advertising seems to be its Achilles heel. In honor of the start of spring training, I'll offer up a baseball metaphor for its performance this weekend. Its title was shortened from that of the novel We Were Soldiers Once...and Young (which apparently should have been appended with And Blandly Good-Looking, Too), yet it's still stuck with a lousy name. Strike one. The material of the film - about a soldier's duty and honor - is, even in these ultra-patriotic times, far too overwrought and cornball, especially when taken in context with the war that is actually dealt with in the film, the Vietnam War. Strike two. Finally, Mel Gibson offers up what might be the worst Southern accent in the history of film. It perhaps wouldn't be such an issue except for the fact that Mel is such a big star, and we know he doesn't talk like that! Foul ball. However, Paramount is throwing its full support behind the film, with an ultra-wide release of 3,143 venues, making sure that everyone who isn't turned off by the ads can get to see it. Ball one. Most importantly, Mel Gibson has never had a film designed for mass consumption completely disappear; his worst opening film in the past five years was the animated film Chicken Run at $17.1 million, and that turned into a sleeper hit. His participation nearly guarantees at least a respectable performance on opening weekend; a solid double into centerfield of $18-19 million. Dispensing with that awkward construction, let's look at the underdog new release of the weekend. Starring newly-minted ShowWest Star of the Year Josh Hartnett, 40 Days and 40 Nights will be the obvious date-movie choice of the weekend. Its subject matter, a vow of total abstinence, seems nearly guaranteed to spark post-movie conversation. Besides an intriguing concept, it has been getting terrific amounts of commercial support with very funny ads. This started early, with a minimalist teaser, but hasn't let up, with commercials focusing on the routes people go through to try and break the main character's vow. I think they've been very clever at hinting at the playful humor and chemistry between the leads. Certainly the exposure Josh has received from his appearances in Black Hawk Down and Pearl Harbor can't hurt, either. That said, it is going to appear on far fewer screens than this week's other big gun, and on a relatively small 2,225 venues will have difficulty taking the number-one spot. Look for a number in the low- to mid-teens, with lots of room for expanding screens in the coming weeks. Last weekend's number-one film, Queen of the Damned, looks doomed to a 50% or larger drop this weekend. In addition to its massive frontloading in the opening weekend itself, it has to deal with the precipitous nature of horror films and very mediocre CinemaScores (which I think hide somewhat the reception of the film). It should lose at least one spot to the strongly-performing John Q (dropping only one spot to number three), although it has enough of a lead that it should stay ahead of Dragonfly in the box-office standings. Despite heavily pushing a twist-ending angle, this will not become the next The Sixth Sense or The Others. The strongest film among returnees, however, is Disney's Return to Neverland, the number-one family choice out there. Its success despite unspectacular ads makes one wonder why Disney has made the choice to take another animated sequel, Cinderella 2, direct to video. If they can coax $45-50 million out of Return to Neverland, as they appear on pace to do, why not another sequel? The Lord of the Rings continues to churn along at a few million per week, and this weekend will pass Home Alone to move into spot number 13 all-time in the box office. This puts it a scant $20 million or so from reaching a spot in the all-time top ten. A Beautiful Mind also continues to be a strong earner and gets close to a $140 million total after this weekend, as it closes in on the Oscar ceremony.